After topping myself with the Jorogumo drawing, I decided to go easy on myself and just draw something fun. So, here is the Chochinobake. Like the Kasa Obake, the Chochinobake is a class of yokai spirit that inhabits objects and brings them to life once an object reaches 100 years, in the case of the Chochinobake, it inhabits an old paper lantern called the Chochin. It is a lantern made out of bamboo, paper, or silk. They are typically described as having one eye and a long protruding tongue. Usually drawn with a full body for that jack-o-lantern effect. My version is similar to its depiction, save for using elements of the lantern itself as the limbs, like the lower segment forming legs and the lantern handle forming the arms. 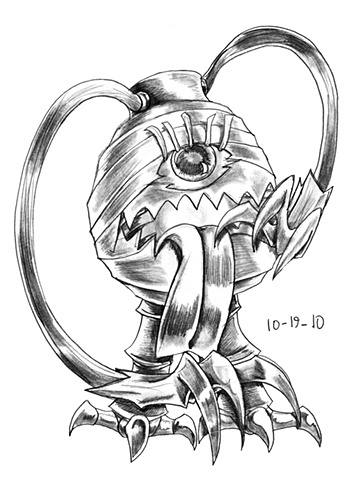 I kept the Cyclopean eye and since its a lantern, I kept the inner mouth as a glowing maw with its ribbon tongue and general mischievous demeanor.